Perhaps the best known species is Medinilla magnifica or ‘ Malaysian Orchid’ is a native of the tropical forests of the Maylasia and the Phillipines. Well known for the large clusters of pink flowers. Many other species and named cultivars are available for sale however it is Medinilla magnifica that is the one most highly sought after. Like most species M. magnifica requires a warm humid climate. 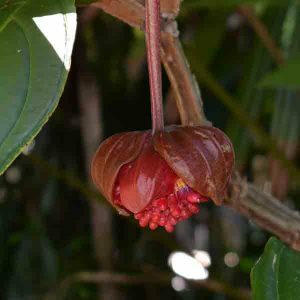 These are naturally an epiphytic plant and are found growing on trees in rainforest areas. Today they are popular plants in tropical to sub tropical gardens. Give them humid, warm and moist growing conditions and they will reward you with beautiful flowers and good foliage. Medinilla magnifica will grow to over 2m. has showy pink flowers that hang down. A hothouse or indoor plant for most of us who do not live in the tropics, but worth the effort. With over 300 species, Medinilla are found from Africa through to New Guinea and Northern Australia. Best in a position where the soil can dry a little between watering. Over watering is one of the main problems. If you are using a good potting mix, try a 50% medium orchid mix 50% good quality potting mix. Watering every week should be sufficient except in very hot weather. As most gardeners will grow these as a potted plant, try immersing the pot in water for 10 minutes once a week. Drain well before returning to its saucer. Try to maintain a temperature between 18C and 24C. Good strong filtered light, and away from any cold drafts. If growing outdoors avoid temperatures below 12C, and avoid any direct sun. These are an understory plant and require filtered light. Shade cloth is suitable protection. Plants should be deadheaded after the flowers have faded. This is also a great time to fertilise. As plants develop you will need to prune then to size. Look for a the lowest 2 pairs of leaves that are healthy and growing. Prune back to these. Never prune back to a stem with no healthy foliage. Plants are best repotted immediately after flowering. You can water Medinilla in two ways, the first is to water the plant from the top, avoiding watering the foliage and flowers. The second way is to water by soaking. Fill a sink or other large container with water to 3/4 the height of the pot the plant is growing in. Sit the container with the Medinilla plant in the water. Allow to soak for 10 – 15 minutes. Remove and allow to drain for 10 minutes. Your Medinella plant is now watered. Repeat when the soil begins to dry. Medinilla plants are available for sale online from the following participating nurseries.